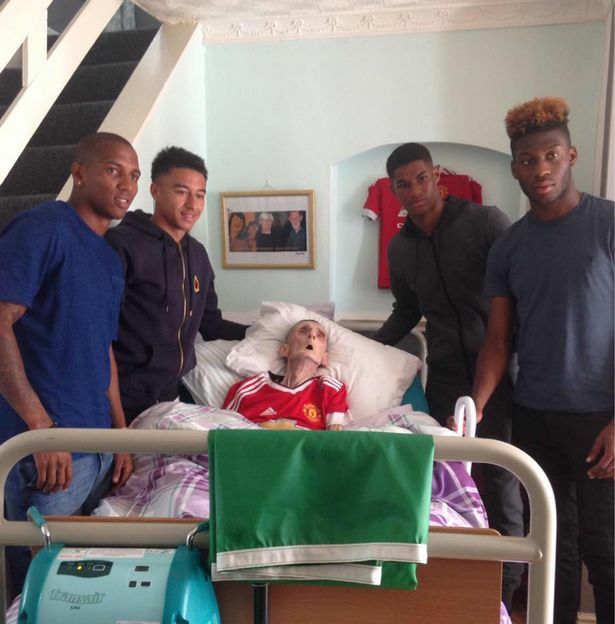 This is the beautiful moment a dying man’s wish came true when four Manchester United footballers came to visit him by his bedside just minutes before he died. Paddy Lawler, from Wythenshawe, Manchester, was told he had only months to live after he was diagnosed with prostate cancer – but his last wish was to meet some of his heroes, reports the Mirror. The lifelong United fan’s granddaughter decided to post an appeal on Facebook in a desperate attempt to get her plea recognised by someone with any connection to Man United, and amazingly it was. After being shared over a thousand times, a cousin of Jessie Lingard’s spotted it circulating on Facebook and gave him a heads up about it. Three days later the United winger and three other players – Marcus Rashford, Ashley Young, and Timothy Fosu-Mensah – all attended Paddy’s home where they chatted and posed for photos. Forty-five minutes after they left, Paddy lost his battle with cancer. Paddy’s daughter later posted to Facebook to describe the players as being ‘incredibly selfless’. Top lads, all four of them. Thanks so much to everyone who helped. Sure my grandad’s over the moon. What a tragic but heartwarming story.